Due to unforeseen circumstances, such as my internet connection unexpectedly becoming unreliable, personal issues, and, most peculiar of all, Crunchyroll failing to properly stream Valvrave until now for me, I have been unable to follow Valvrave the Liberator. Luckily, Miki had better luck and kept you appraised on the anime. Now, those who read both my and Miki’s Initial Impressions will know our opinions greatly differed. While I thought the anime began incredibly strong, he thought it just mediocre, and from subsequent reports felt the series improved. As it turns out, I felt the opposite; boy was I wrong! The intense feelings I felt after episode one quickly diminished as I awoke from my ideal dream of what Valvrave would be, and I was left with what it actually was. The two are pretty different. I expected the anime to continue on with Haruto following a path to work with the government to fight the enemy Dorssians while dealing with his vampiric ailment with some turns and twists, all the while following a concrete plot. Instead, we discover Shoko is alive and well and spend the next few episodes very confused – firstly on the overarching plot and secondly on what exactly Valvrave is meant to be. Was this meant to be a flashy mech battle anime, or a political war anime, or the adventures of a select few ‘special kids’ piloting giant mechs because why not, or will we have elements of fantasy blend with the sci fi? The answer to this question as of right now is all of the above elements thrown indiscriminately into a mixing pot, alongside a few others. However, after four to five episodes of disjointed feelings, things have begun to come together at episode seven as everything begins to make sense with one incredible opening scene. The characters have begun to stand out over the course of the episodes and show purpose for even existing. We have Saki, who has been driven by her ambitions of being famous to make up for some horrors in her past, Shoko has been slowly becoming the leader of New Jior, which she finally attains in episode ten, Inuzuka goes from greedy for money to fighting for the honor of the girl he lost, as well as to protect the others in the colony, and Thunder…remains Thunder. But hey, Thunder is still a total badass even if he is annoying and very reminiscent of Kuwabara from Yu Yu Hakusho (who I also found annoying). We have also gained some insight into the Valvraves, namely a little bit on how they came to be, and why. 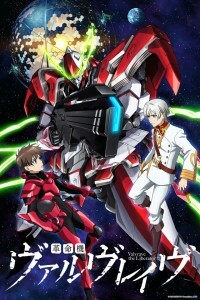 So far it seems Valvrave Red has a special system that generates a lot of influence on Haruto and his vampiric side, and compared to the others he seems to have it the hardest. It is unknown right now what the purpose of this vampiric curse is for piloting the mechs, but it is definitely going to affect the love triangle going on between Haruto, Shoko, and Saki. (I’m refraining further commentary until the Season 1 Review due to the controversy created at the end of episode 10 until I see how it plays out). Most interesting, though, is L-Elf and his development from being an enemy of Jior to becoming an ally. He has been under a lot of scrutiny from me, as I try to grasp what his deal is. My conclusion for the moment is that he is a soldier Mary Sue. He is the perfect soldier with no visible faults, minus some events from his childhood, as seen in flashbacks. I believe there is much more than meets the eye here with L-Elf, and I would be premature in saying his role at the end of episode ten as strategist for the school will be his final calling. He is up to something, and it won’t be anything pretty. At least I don’t think so. My biggest complaint with this anime as a whole is actually the compartmentalization of various parts of the story. For instance, there are whole episodes dedicated to student life, some dedicated to battles, and others contain background information on the war. The anime would do a great deal better if compartments were allowed to mingle more. Luckily, the animation and music remain superb throughout, and the story and characters are stabilizing into something I hope can become as epic as I initially hoped. I will not get my hopes up, however, and will just go with the flow of this roller coaster ride that is Valvrave the Liberator.